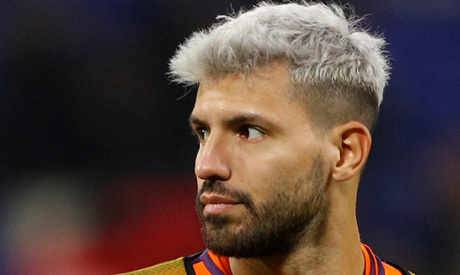 Manchester City forward Sergio Aguero is doubtful for Tuesday's trip to Watford in the Premier League as he tries to recover from a muscle injury, manager Pep Guardiola has said. Aguero, City's joint top scorer with eight league goals, missed Saturday's 3-1 home win over Bournemouth and Guardiola will be keen for the 30-year-old to avoid aggravating the problem ahead of the busy December period. The Spaniard told a news conference he did not know if the Argentine would be available for the trip to Vicarage Road. Guardiola will make a late decision on midfielder Oleksandr Zinchenko, who injured his nose against Bournemouth, while Kevin De Bruyne is continuing his recovery from a knee injury. "We have training this afternoon, so I can't tell you the answer now. De Bruyne is not ready. The other two I don't know right now," the City mnager added. Leaders City are away at Chelsea on Saturday and also play Everton, Crystal Palace, Leicester City and Southampton this month before a clash with title contenders Liverpool on Jan. 3. Guardiola, whose side are two points clear at the top, is comfortable rotating his players with such a heavy schedule. "I have a good squad, I trust my players. We have a lot of games and they are going to be involved... we're always working towards today – nobody knows about the future. We try to do our best," he said. Guardiola backed City's England forward Raheem Sterling to improve further after taking his league tally for the season to eight in 12 matches with a goal in the last game.